Welp… at least we have Straight Outta Compton. All Eyez On Me is written by Jeremy Haft, Eddie Gonzalez, and Steven Bagatourian, is directed by Benny Boom and stars Demetrius Shipp Jr., Kat Graham, Lauren Cohan, Hill Harper, Jamie Hector, Annie Ilonzeh, Jamal Woolard, Dominic L. Santana and Danai Gurira. It tells the life story or late rapper, actor, poet, and activist Tupac Shakur, including his rise to superstardom, as well as his imprisonment and prolific, controversial time at Death Row Records. With films like Straight Outta Compton and Love and Mercy telling compelling stories about impactful artists, a Tupac biopic was sure to be made. Now, I went into All Eyez On Me unsure of how it would turn out. Now, I don’t like tearing movies apart, but I can’t help myself here. 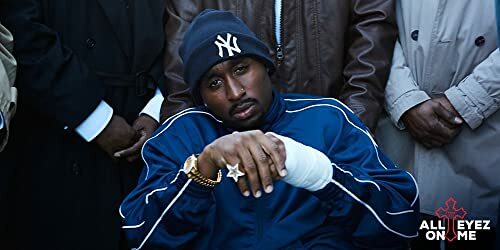 All Eyez On Me is a tone deaf, unfocused, choppy mess with overacting that does not live up to the artist it’s based upon. I really like Tupac, and I like movies, but this did not work on any level. Benny Boom is directing here and he simply does not do a good job. In the past, he’s directed projects like 48 Hours To Live and Next Day Air, but he is mainly known for his music video work. I’m sure he really wanted to make a faithful biopic telling Tupac’s compelling story, but it doesn’t pan out. The whole narrative is very jumbled and unfocused. He often jumps from year to year and city to city with no grace. Scenes don’t feel like they end and often serve no point to the narrative. He is working with great actors like Danai Gurira and condenses them to loud and one note characters. Everything here feels painfully amateur and I can’t help but think if a different director handled this material it would have been much better. All Eyez On Me is a mess, and while it doesn’t all fall on Boom, he is the director here. The screenplay is written by Jeremy Haft, Eddie Gonzalez, and Steven Bagatourian and it’s a mess. There is no focus or throughline between any scenes and plot lines often go nowhere. There is a whole subplot where Tupac is being interviewed by Hill Harper that has no impact on the plot. Many scenes consist of Tupac doing something wrong, a friend calling him out, and then Tupac talking philosophy. This results in a tone-deaf narrative that tries to paint the complex Tupac as a perfect angel, making him very unlikable. Not have they made their main character very unlikable, but they’ve diminished the legacy of one of the most influential people of our time. I’m sure everything here is very accurate, but they jump around so much that characters feel different from scene to scene. The dialogue is cheesy and on the nose. This is the biggest project these 3 have worked on and let’s hope they try harder on their next one. For a biopic about a poet, All Eyez On Me script is shockingly bad. 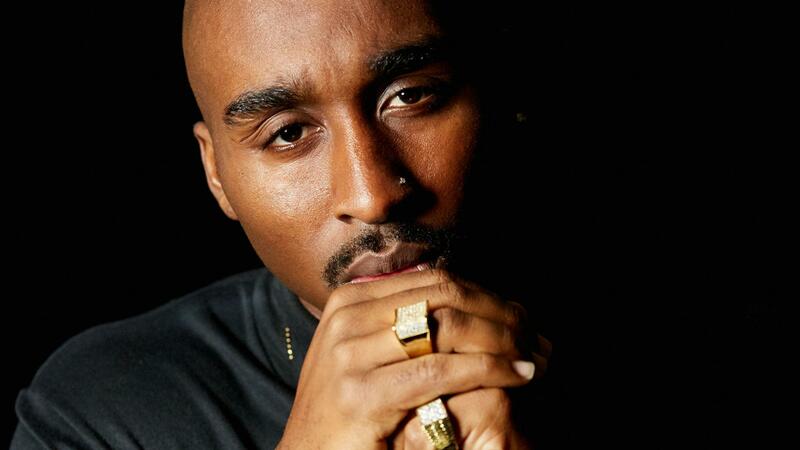 Tupac is played by Demetrius Shipp Jr. and… uh…he sure looks like him. Shipp is not very good at all. He honestly feels like he’s in a high school play. An acting coach would have served him well. While Shipp looks alarmingly like Tupac, he doesn’t capture the person he was. None of the cast is particularly bad, but none of them are particularly good either. Most of the characters are simply loud and obnoxious, but to their credit, the script they’re given to work with isn’t very good at all. Danai Gurira is interesting here. I mentioned here previously because, I know she gave a good performance, but the way the scenes are edited and strung together, she just yells and says the F-Word a lot. Now, I need to take some time to talk about Jarrett Ellis, who plays Snoop Dogg here. I don’t know if he gave a good performance because the filmmakers thought it would be a good idea to have Mr. Dogg dub his voice over every line he says and it’s the most jarring thing of all time. It’s so weird that I don’t even know what to say about it. It’s glaringly obvious and very silly. On a technical level, All Eyez On Me is also a mess. The editing is atrocious and honestly reminded me of last years Suicide Squad. The cinematography is bland and the camera is rarely moving and consistently stagnant. The sound design is particularly bad as well, often times in the concert scenes you can’t hear what they’re saying over the screaming. Everything about All Eyez On Me is just poorly done. Everything is either rushed, sloopy, or just simply bad. I guess the production design is alright, the cities and skylines look cool. The music is great, I can’t deny that. I’d pop in the soundtrack. BLU-RAY REVIEW — "3 Generations"